This post contains affiliate links, which means I make a small commission from the links you shop from on my page at no cost to you. Thank you for supporting my blog. I feel like going back to school is centered around the kids. Sometimes Mom’s get to go back to school as well. 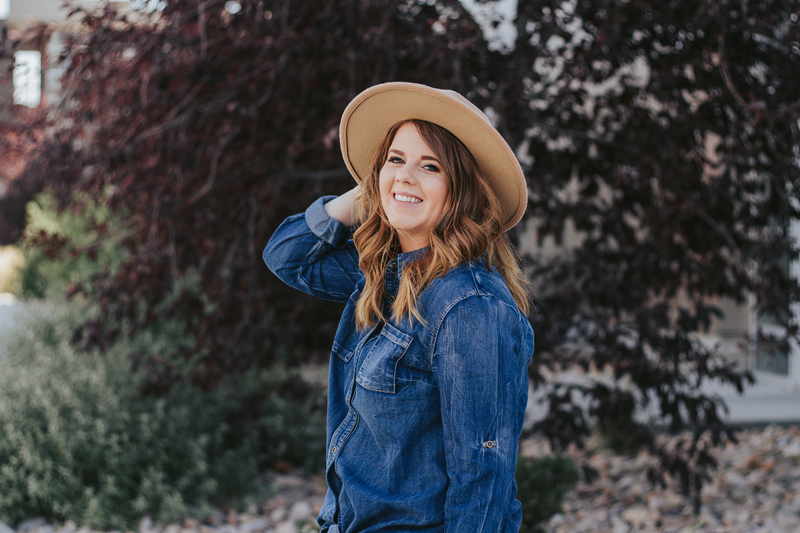 So this fun outfit isn’t only perfect for those brave mom’s making their way back to school this outfit applies to those just looking for a fashionable way to style chambray for fall. Fashion is all about expressing yourself. Putting your stamp on every outfit is important from the runway to the hallway. If it isn’t you the clothes will wear you instead of you wearing the clothes. Have fun with your style, fashion is in the eye of the beholder. I have always said it’s not about what is trendy it’s about how you wear what you love. Chambray/denim is a love of mine, and always will be. It is such a staple in everyone’s closet. Man, woman, or child. You can style it in so many ways with so many fabrics. If you are on a budget you get a lot for your money with one piece. Today I styled this look with a cute pair of olive jeans. 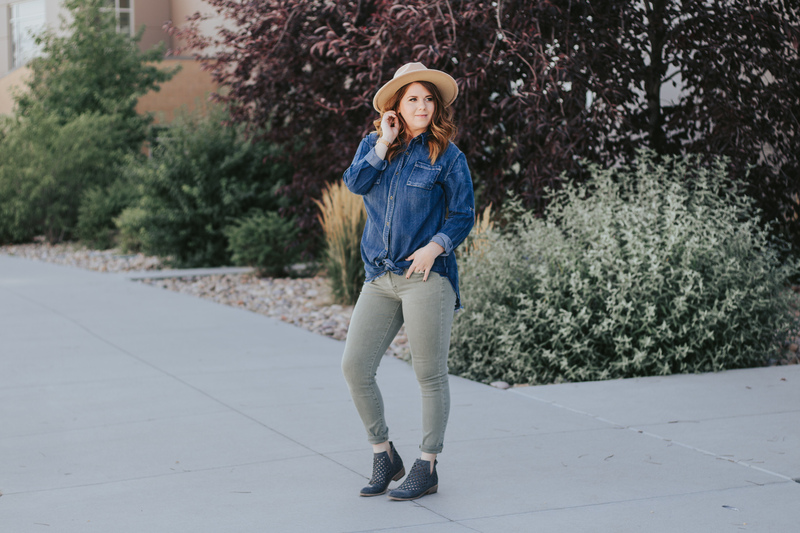 Olive jeans are so chic for any age. It translates so well from younger to more mature women. 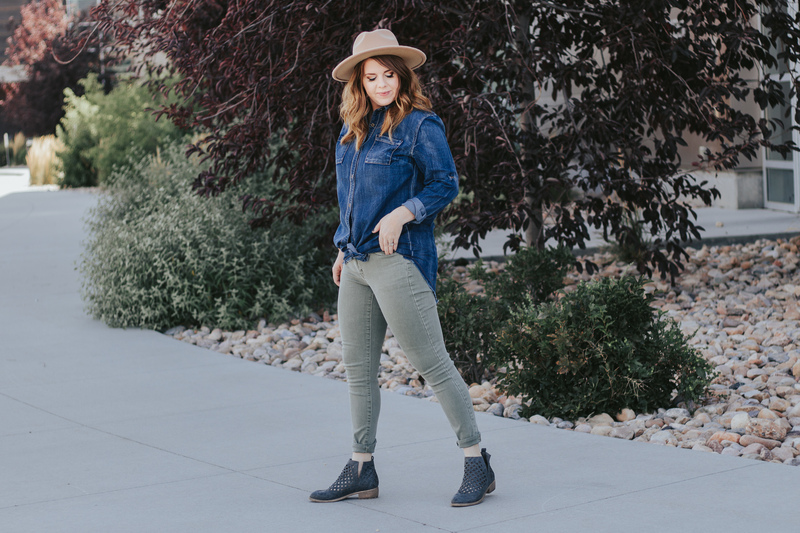 Much like the chambray top, olive can be paired with numerous amounts of colors, textures, and patterns. 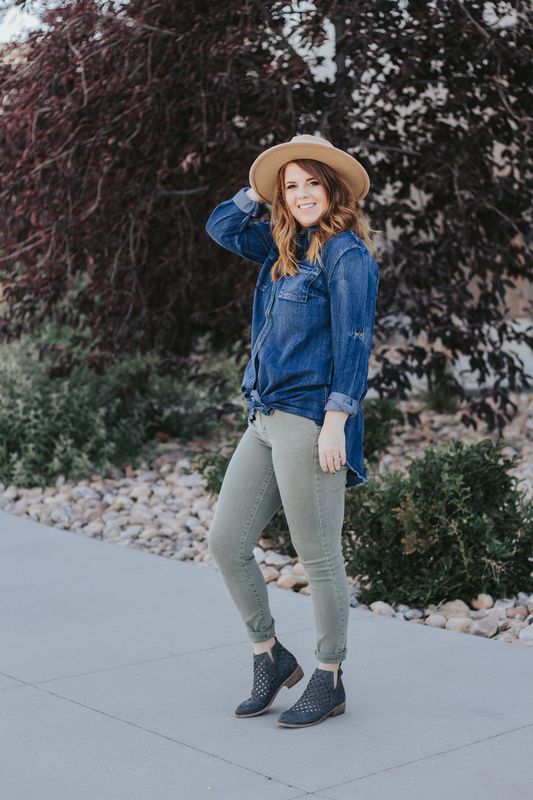 Pairing these olive jeans with this really cute chambray tunic is such a classic but chic way to amp up an outfit. You can leave the shirt out long or tuck it in. I tied my top to the front, because I am obsessed with tie front tops lately. This top would also look gorgeous over a pair of black liquid leggings, or over a cute stripped dress. 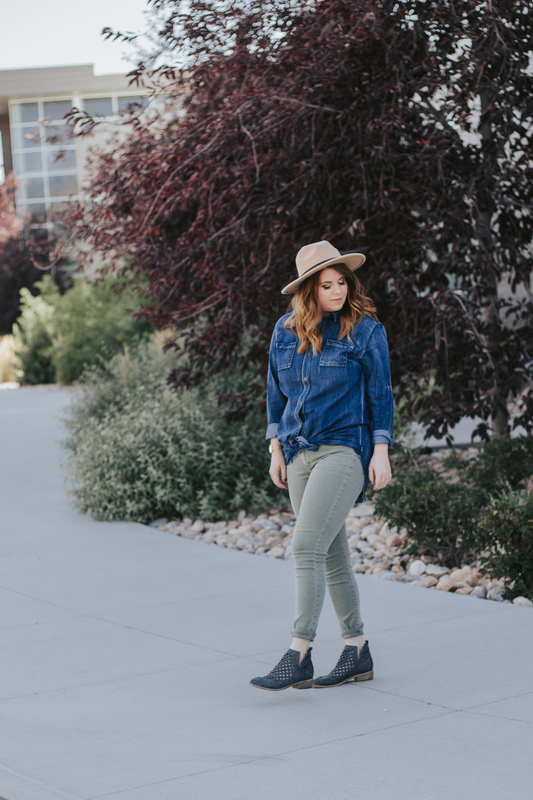 For accessories, I added a cute pair of perforated booties and my favorite Amazon hat. 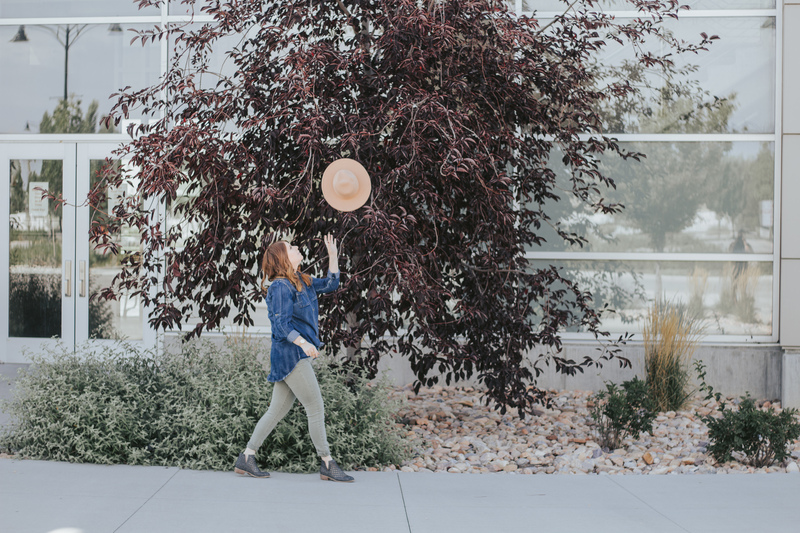 This outfit would be so cute for back to school, or back to fall whatever path you are traveling. I hope you love this outfit as much as I do. 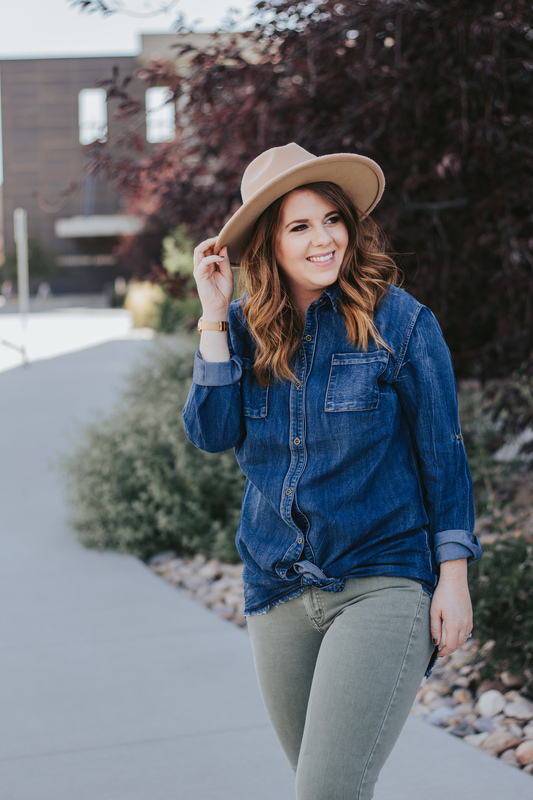 This chambray top is absolutely stunning. Sizing is TTS so I am in a medium here. Liam & Company has so many cute items to shop from, at affordable prices. I will be adding them to my #Thrivingthrifty shops I love because I LOVE THEM!